Russian experts discuss the potential outcomes of the current situation in Egypt. As the situation in Egypt deteriorates, the Russian Foreign Ministry has recommended its citizens to refrain from visiting the country. The Ministry for Emergencies said it was ready to evacuate Russians currently in Egypt if the country’s leadership issued such an order. 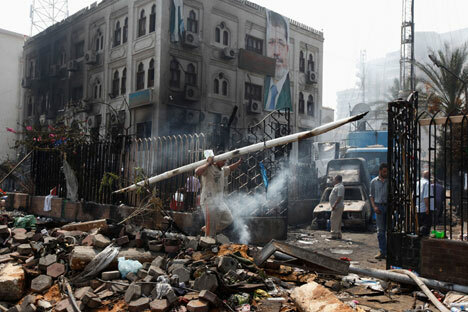 After the dispersal of anti-government demonstrations in Cairo, the death toll has risen to 500. As of August 14, a month-long state of emergency has been announced and a curfew has been imposed in 11 provinces. The scale and ferocity of the clashes in Cairo have prompted fears of a real civil war in Egypt. Russian experts admit that the risk of a flare-up is high but hope that the Egyptian elites will be reasonable and come to terms at the last moment. Professor Marina Sapronova of the MGIMO Oriental Studies Department believes that, considering the latest developments, the situation in Egypt is unlikely to return to normal any time soon. “The situation is very complicated; it is a big country and society is split,” she says. Sapronova is sure that, in the end, Egypt will revert to the old system because, as in the past, there are only three real political forces in the country: the Islamists, members of the old regime and the Army. “Everything hinges on a consensus between these three forces because there are no other forces that can make a difference in this situation,” she points out. She is convinced that the army will play the key role: “A political settlement plan is to be unveiled shortly, a kind of road map developed by the military. The constitution will be changed, amendments will reduce the President’s powers and give more powers to the Army. The new constitution will form the basis for resetting the political system, a government will be formed and elections will be held,” she says. Sapronova told RBTH that the evolution of the situation in Egypt would depend on how quickly the authorities will be able to solve the country’s economic problems. “Assistance from external players, such as Saudi Arabia, would be very important for that,” she adds. The expert warns that there are many serious prerequisites for a civil war in Egypt, now that an attempt has been made to exclude the Muslim Brotherhood from the political process. This could bring to a radicalisation of the movement, with them turning into underground militants. Kosach is also of the idea that the current wave of violence might provoke a split within the military and security forces and cause some of them to take the side of the Muslim Brotherhood, as there are surely Islamist cells within these military establishments. The crisis might be aggravated by the fact that the current Egyptian government is extremely unstable. “There was no consensus as to what to do with the demonstrators. The resignation of ElBaradei is a clear pointer to that. Other resignations may follow,” Kosach says. Speaking about Egypt’s political future, Grigory Kosach notes that, considering the weakness of the civilian administration, the military might establish a dictatorship ‒ but that period wouldn’t last for long, as the global community’s reaction could turn out to be highly negative. “The Generals do not want to be deprived of military aid, so they will have to restore parliamentary life and write a new constitution,” he explains. Vasily Kuznetsov, Associate Professor at the Faculty of International Politics at Moscow University, says that one should expect “a long period of political violence” in Egypt, as was the case in Algeria in the 1990s, rather than a civil war like in Syria. He lists several factors that are contributing to the destabilization of the situation. First, society is split down the middle. Second, there are economic problems that take time to solve. And third, a lot of people have weapons, and militants keep arriving from Libya and Syria. “Events might follow one of two scenarios. The first has the political elites proving to be wiser than the population, reaching a compromise and pacifying the masses. Yet that is only possible if people are unarmed. The second scenario would see military confrontation,” Kuznetsov argues. The expert notes that, in order to overcome the crisis, the military first has to disarm the population and come to terms with the Muslim Brotherhood. “A government of technocrats has to be installed. And there should be no parliamentary democracy in the next year or two. The authorities cannot allow themselves to take the cue from the street. Even so, an advisory body including Islamists should be set up. It would also be desirable to tap the resources of the Egyptian diaspora abroad,” the expert stresses.